Trigonometry! Ha! I Laugh in your Face! Disclaimer: This is a blatant case of bait and switch! So my son had a meeting with a tutor the other day because he actually wants to learn these subjects. It’s a complicated process involving finding a qualified person, checking references, calculating return on investment, and fitting the session in around other appointments, obligations and meetings. My wife takes care of 99 44/100% of it, while I, on the other hand, am responsible for chauffeuring. In in case you don’t know, the most common and generally accepted venue for private tutoring is a meeting room at the public library. This branch was particularly small, but I believe the Constitution requires all libraries, regardless of size to have meeting rooms. My son and the instructor took off, and I sat down, got bored, walked around, and sat down again. I walked around the non-fiction section, and although they had a collection that must run in the dozens, nothing looked the least bit interesting. Once again I sat down, etc. 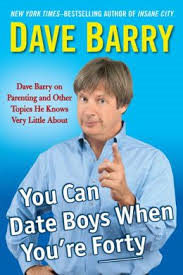 This time I accidentally turned into the fiction aisle, and there, staring at me was Dave Barry. It was his new book, You Can Date Boys When You’re Forty. So, as my son is cosining his trigonometry, I’m muffling my giggles. While there may be no serpent’s tooth sharper than an ungrateful child, there’s nothing more delicious quietly giggling while others study trigonometry. This entry was posted in Arts, Celebrity, Communications, Culture, Education, Family, Humor, Media, People, Philosophy, Writing and tagged math, trig, trigonometry, tutor. Bookmark the permalink.